High Impact teams operate in an atmosphere of trust. Championship basketball teams can run last-second, game-winning plays, moving the ball quickly from person to person for an open shot, because they trust each other to be where they need to be and execute their role. But when it’s time for the leadership team in a corporation to put together the upcoming fiscal year’s budget and they’re tasked with increasing profitability by eliminating costs, many react by trying to protect their departmental funds and headcount, withholding information, and keeping their team under the radar. As members of the leadership team jockey to keep what they have, they morph into territorial adversaries, and their lack of trust in each other produces a company culture full of suspicion and mistrust. Strong relationships—personal and professional—are built on trust. A junior executive’s boss kept missing his one-on-one meetings with her; she wondered if he wasn’t happy with her performance and her on-the-job confidence plummeted. A team at a large corporation knew that a change in leadership was coming, and the uncertainty—not knowing when the change would happen or who the new leader would be—bred an atmosphere of open distrust. In a nutshell, trust doesn’t just happen, and it isn’t static. Trust is either growing or eroding; it’s actively developed and needs to be maintained—just like a gardener pulls weeds and tends the soil so that flowers will flourish and bloom. What level of trust do you have in your teams and relationships? 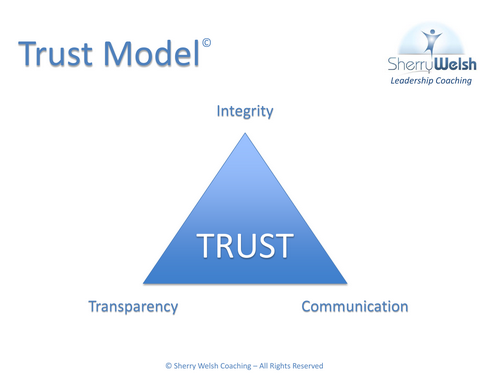 I developed the Trust Model from years of observations while working with clients; it’s surprisingly simple but also extraordinarily powerful. Integrity, transparency, and communication are the three key elements I have found that determine whether trust is growing or eroding among teams and in other relationships. If you pay attention to them, you can build trust even when those around you may not be aware of the Trust Model. But if you ignore any one of these three things, you’re likely to find trust eroding. You most likely have an understanding of these elements already—and to the extent that you’re aware of them in various relationships, the Trust Model might already be working for you. But there may be areas where trust has broken down, and you may or may not understand why. The Trust Model, applied consistently and consciously, is a powerful tool for building trust in others and increasing your own credibility. Although the three elements of the Trust Model are interdependent and more or less inseparable, in this article we’ll discuss them individually to see specifically how each one factors into fostering healthy, trusting relationships. Integrity: Do what you say you’re going to do. Integrity is often associated with morals and ethics, but I like to simplify it: to act with integrity is to do what you say you’re going to do, to honor your word. Most people don’t feel good when they are out of integrity—that is, when they’re breaking their word and not honoring their commitments. Suppose you promise your child that you’ll be at their school play, but an urgent issue keeps you at work and you miss it. By choosing work over your original promise, you’re out of integrity. This kind of situation is a by-product of the treadmill life that many people find themselves living today. (I discussed the treadmill life in detail in my book, Slowing Down, and in my podcast episode, “Treadmill Living vs. the Slowed-Down Life.”) As our schedules fill up, we may feel a sense of overwhelm. Or perhaps we simply forget or misunderstand what is expected of us because of the whirlwind pace we’re keeping up. Before we know it, we’re out of integrity. Living in integrity is a conscious, day-by-day practice. Maintain integrity with transparency and communication. The good news is that it’s never too late to get back into integrity. In other words, if you can’t honor a commitment, be transparent and let people know. Here’s an illustration. A while back, I committed—a year in advance—to joining an event that a colleague was planning. As the months passed, however, my schedule filled up with other things—my coaching calendar was full and I was preparing to move from Michigan to South Carolina. I realized I had overcommitted myself. As a sense of overwhelm kicked in, I realized that I could no longer attend my colleague’s event. My colleague hadn’t changed, and neither had her event. But the circumstances that I had said “Yes” to had changed, and I was in danger of failing to honor my word. Maybe she would lose respect for me and would never invite me to an event again. I decided to own the situation and approach the conversation with a Level 5, partnering energy. I told her, “Look, I want to apologize for this change. I’ve overcommitted myself, and I can’t make it to your event any longer. I want to let you know well in advance so that you can find someone to replace me.” She was grateful for my transparent, clear communication—not upset with me—and within a week she had found another coach to take my spot, someone who was an even better fit for the event than I had been. What happens when someone you’re working with is out of integrity? It’s relatively easy to control whether you, personally, act with integrity: either do what you said you would do or be transparent and communicate about any delays or obstacles that come up. But what about when someone else fails to honor their word? Recognize that they most likely don’t want to be out of integrity; the breach of their word is probably unintentional. It’s possible that they believe that they are keeping up their end of whatever agreement you have in place; in this case, there could be a misunderstanding or lack of communication in co-creating a clear agreement. If they are out of integrity, there may be a lack of transparency in play; something is delaying, hindering, or preventing them from keeping their word and they haven’t been up front about it (possibly for reasons like the ones that occurred to me when I needed to withdraw from my colleague’s event). As you can see, communication and transparency are thoroughly intertwined with integrity and vital to maintaining it. Let’s discuss how transparency fits into the Trust Model in more detail. Transparency: Put everything on the table. This scene is a great illustration of how transparency works in teams and relationships. When not everything is on the table, there are inherent delays and inefficiencies. In the case of the Apollo 13 mission, it was physical and literal, and it’s easy to imagine that if any component of the eventual solution were left off the table, it would have hindered NASA’s efforts to save the astronauts. With teams, the pieces aren’t duct tape and tubes and canisters—they’re bits of information—conversations, data points, and perhaps an opinion about something. When not everything is on the table, teams lack cohesion. When there’s an undercurrent of distrust (in my experience, this is most often related to people protecting their budgets and headcount), the sense of distrust is felt by everyone in the room. Because there’s distrust, people are not open and honest, and the lack of transparency breeds more distrust. Breaking out of this negative cycle is a bit of a dance; someone needs to be trusting enough to start putting things on the table. In some situations, your past experience with a person or with the rest of the team may have given you good reason to not trust them—maybe they haven’t kept their word about certain things, or you know that they’ve withheld information before. But beginning to share openly, honestly, and professionally about things that are relevant to the task at hand will start the process of rebuilding trust. Transparency should be limited by a few important modifiers—share what is relevant, share appropriately, and, to the best of your ability, share what you know. 1. Share what is relevant. In business, some things are not appropriate to share—for instance, confidential matters, delicate points related to negotiations or legal affairs, or subjects that upper-level executives need not disclose to other employees. 3. To the best of your ability, share what you know. Because transparency influences people on an intuitive level, as the “dance” of transparency unfolds, anyone who isn’t being transparent will begin to feel uncomfortable. Energy entrains; those who are operating at the higher levels of energy, caring (Level 4), partnering (Level 5), and envisioning and creating (Levels 6 & 7) will naturally bring those around them up to similar levels. The ones who are still withholding information, still fighting (Level 2) to protect their territory, will eventually get on board as they begin to realize that it doesn’t make sense to keep fighting when others are not fighting back. For teams—and, in fact, all relationships—this is transformational. Building trust builds effective teams and solid relationships. It allows groups to do their best work in the most efficient way: achieving the goal, finishing the project, solving the problem. Communication: Ask for what you want. In the evolutionary process of building trust, integrity and transparency are tied together by clear communication. Communication is, of course, a very broad word, so it’s helpful to define more specifically what it means in the context of the Trust Model. We naturally think of a speaker’s message when we think of communication, but delivering the message is only part of being an effective communicator. It’s hard to have a clear, co-created agreement between two parties when no one’s asking for what they want. If you don’t say what you’re looking for, you’re not being transparent, and you’ll find it harder to stay in integrity with an agreement that doesn’t cover your needs. So, if you need an extra week, ask for it, and be transparent about why you need it. If you need resources that aren’t currently available to you, speak up. And if you want higher compensation for your work, ask for that, too. Using empowering questions like these is the way to own your message and ensure that it’s received and understood. This type of question is also the way to make communication effective when others are not being specific, clear, or transparent in their choice of words. Because communication is a two-way street, listening is just as important (if not more important) than speaking. An effective communicator listens so that people feel heard, feel understood, and feel like their voice matters. Of course, if you’re not listening, you can’t understand what’s being said. But even when you are listening, what you hear is colored by your own history and experiences. Listening and then asking for clarification adjusts the filter of your understanding so you can truly grasp what’s being said. Gaps in communication are usually filled in with assumptions. We all make assumptions at times. For example, you may assume your boss wanted the project completed by next month, but she needed it this Friday; you assume you ought to complete your work the same way you did last time, but the process may be completely different because the client’s business has changed; the illustrations are endless. A lack in communication often results in wasted time, exerting additional effort, and spending more money than planned. The team may end up doing tasks twice, or miss deadlines, or maybe doesn’t finish at all. People are out of integrity, respond with less transparency, and trust erodes. To work more effectively and efficiently, slow down. Trust, when it comes to groups—companies, clubs, organizations—is not primarily an issue of making people feel good; it’s an issue of their efficiency and effectiveness. People join together in a team for a purpose, to accomplish something. The more a team builds trust through integrity, transparency, and communication, the more optimal their energy is and the more efficient they are. Efficiency in a business context means cost effective. When businesses are more efficient, their efficiency translates into a better bottom line, more innovation, increased opportunities for philanthropy—all kinds of benefits. The difficulty we all face is the breakneck speed of life in the 21st century. Rushing from meeting to meeting, constantly putting out fires, our lives are often reactive and far from deliberate. It’s possible to cut through the clutter simply by slowing down and taking time to communicate with the goal of arriving at clear, co-created agreements on the front end of our tasks, assignments, and projects. The two, five, or ten extra minutes you spend in a meeting asking empowering questions and making sure that everyone’s on the same page may save weeks or months in the long run—not to mention that taking those few minutes can also avoid the spiraling descent into mistrust. Slow down the conversation. Be transparent; get everything on the table. Talk through the difficulties and obstacles; ask questions for confirmation and clarity. Communicate until you’re sure there’s cohesion and a common understanding. When teams meet with this level of transparency and communication, it’s that much easier for everyone to act with integrity, to go out and do their part. And in the process, trust continues to grow.